This past weekend during our quest for a new dish washer we stopped by a Chick Fil A for lunch. Mom and I are big fans of this restaurant chain as the workers are high caliber and the restaurant is always spotless. We haven't been here in a while and this is the first time Alyce was big enough to play on the play ground. 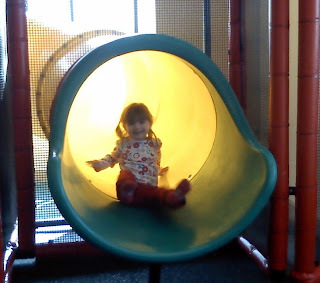 For starters the Chick Fil A playground is the cleanest indoor playground I have seen. It looks like they vacuum it out every night. I didn't see year old french fries in the corners or dust under the slides. During lunch all Alyce wanted to do was to go play on the wee! She calls slides and playground equipment either slides or wee. After I was finished I gave Mom a few minutes off and took Alyce into the playground. 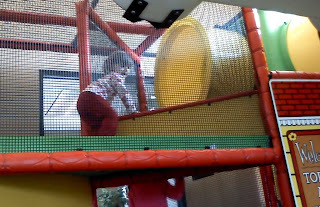 Whenever we are at an indoor playground I keep a close eye on Alyce. I guess I am always afraid she will get lost in the maze of tubes and not find her way out. Over our past few trips to McDonalds I think I can probably relax on this. One thing she would never do is go down the slides attached to these big tube mazes. I'm not sure if she is afraid to do it without me or if she is scared since she doesn't know where they lead. At Chick Fil A, however, she got over this fear. I let Alyce go into the playground by herself and kept an eye on her and like I always do and sure enough she didn't go down the slide. After a few minutes of watching I could no longer see her in any of the windows. Looking down at the slide here comes out my little girl with a gigantic smile on her face. From this point on she was hooked. She took three to four more trips on the slide before it was time to go. 0 comments on "Slide at Chick Fil A"